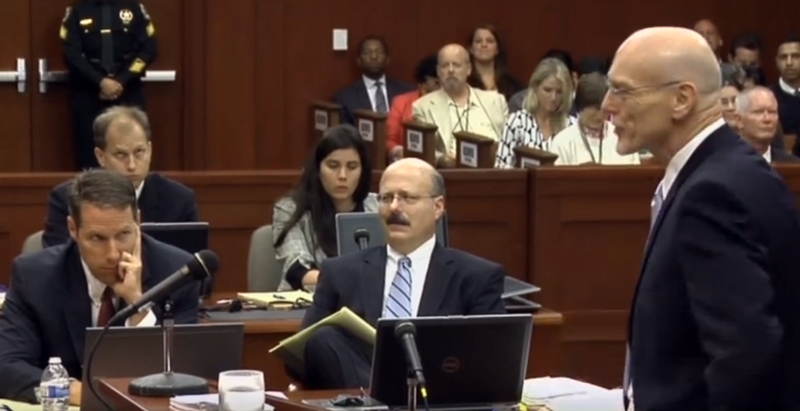 Attorney Don West can be seen in this video as he was making a portion of his opening argument in the defense of George Zimmerman. In it he told his now infamous knock-knock joke. Although this short video is laden with body language examples, it is included here to exemplify one of prosecuting attorney John Guy's nonverbal tells. During the 1:04 - 1:15 segment, Mr. Guy displays a version of the "Double-L" (see image below). Here his index and middle finger of his left hand are oriented vertical on the side of his face, while his ring finger and pinky are curled (flexed) over the left side of his mouth. His left thumb supports his chin. This particular MAP (Manipulator, Adaptor, Pacifier) is a very common and highly reliable nonverbal signaling critical evaluation. Of course in such courtroom theatrics, it is not at all surprising that one attorney would be thinking & feeling critical emotions towards an opposing attorney. However this is also an extremely common body language signal which can be seen in multitude during any business meeting or negotiation. Moreover, it often occurs when negative emotions are being felt and yet with minimal or no signals of verbal disagreement. What emotion does attorney Bernie de la Rionda's facial expression convey in the image below? What about facial nonverbals of the man sitting immediately behind Mr. Guy?